In early November, my husband and I took a birding/”lepping” trip to the southern tip of Texas, travelling from S. Padre island through Brownsville, and along the border to just south of Laredo. It’s a surreal region, with many miles of border wall, and it would not be an exaggeration to say we saw 100 Border Patrol vehicles in the space of a week. And it was over 90 degrees every day. I’ve been trying to figure out how to organize these photos, and decided to start with the eastern end of the trip and go west. Here are some photos from the South Padre Island Birding Center. Mottled duck (Anas fulvigula). Mottled ducks have a black spot at the base of the beak, but they also interbreed with mallards, so this may possibly be a “muddled duck”, a hybrid. This entry was written by whyevolutionistrue and posted on December 1, 2017 at 7:30 am and filed under birds, photography. Bookmark the permalink. Follow any comments here with the RSS feed for this post. Both comments and trackbacks are currently closed. I’m learning there are more jays than just the blue kind. These are all simply lovely, and with interesting commentary. I especially note how the water in several of these pictures looks delicately painted. A real cool effect! The Northeastern US could use a nice green bird like that. The absence of any perhaps related to the seasonal climate and deciduous trees? 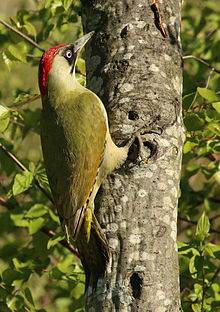 Yet there are green woodpeckers in Yurp, altho not as nice a green. I would like to see a bird like this in the Midwest, also! All nice closeups. What equipment did you use? Just my little Lumix + Digital Photo Professional. That S. Padre Island is a strange place to my Brit eyes – flatter than Holland & damned hot. I took a tour via google maps & noted the condos unprotected from any hurricane that chooses to land. I looked up the Wiki & a condo was pulled down because of settlement of the foundations into what is basically sand. There must be huge potential profits to make it worth building tall or it’s some sort of tax dodge I don’t understand. My Dad, an avid birder, always loved to go to that part of Texas. Apparently the diversity of birds is amazing. Nice photos. Beautiful shots. I especially love the green jay. The green jay looks interesting. Thanks for the pics!